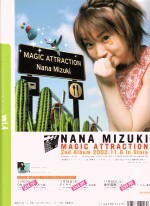 The front cover has Mizuki Nana (水樹奈々). There is no back cover seiyuu in this issue, but the end of magazine special seiyuu is Tamura Yukari. 25 pages on Mizuki Nana. Photos of Nana wearing a kimono, interview about her album "Magic Attraction". 5 pages on Miyamura Yuko, Aikawa Rikako, Iwata Mitsuo, and Toyoshima Machiko. 4 pages on Morikubo Shoutarou. 4 pages on Seki Toshihiko. 5 pages on Inoue Kikuko, about her album "Hidamari". 3 page interview with Kuwashima Houko. 2 page interview with Hayashibara Megumi. 2 page interview with Iizuka Mayumi. 2 page interview with Asakawa Yuu. 1 page interview with Kanna Nobutoshi. 4 page column by Miki Shinichirou and Seki Tomokazu. 1 page interview with Chiba Saeko. 1 page interview with Kanda Akemi. 1 page interview with Iijima Mari. The photo of Mari is monochrome. 8 pages on Tamura Yukari.